This Thursday night the PBC on FS1 presents a fight card with depth beyond the main event between once beaten Sammy Vasquez and gate keeper Luis Collazo. It’s not as though the top of the bill isn’t important to each man’s career but you could make an argument the undercard has just as much on the line. Yordenis Ugas takes on Levan ‘The Wolfman’ Ghvamichava, a very fitting nickname when you see this guy’s body hair, in a scrap that is crucial at this stage for both. Also, in what I believe to be the opener, Ryan Karl meets Eddie Ramirez in a battle unbeaten junior welterweights. 2015 was a great year for a then rising prospect Sammy Vasquez who managed to engage in entertaining bouts and look flashy doing it. The day after Broner vs. Porter at the MGM Grand, Sammy dismantled the power-punching veteran Wale Omotoso in style. Vasquez cruised to a TKO victory that September on FS1, which lined him up to face Aaron Martinez in early 2016 on Fox. Martinez was coming off career performances against Robert Guerrero, whom many though he beat, and Devon Alexander. Unfortunately an elbow injury prevented a two-way fight but none the less Sammy had looked great. Last summer Vasquez’s originally scheduled opponent was none other than Luis Collazo, until a back injury forced Collazo to pull out. As it turned out Sammy’s replacement came in the form of a more difficult test in Felix Diaz. Instead of dropping out Sammy took the challenge of facing a guy with a tricky southpaw style especially on late notice. Looking back on it Sammy would’ve been served better to have a full camp focused on Diaz solely. To be fair though, judging by the outcome it may have not made a difference. Many think that Collazo is way past his prime to beat Vasquez, those same people were saying that in the summer of 2015. That same faded former champion showed he still had plenty in the tank against a better fighter than Sammy in Keith Thurman. The Puerto Rican brought the fight to Thurman and nearly dropped him with a vicious body shot. A few rounds later the fight was stopped due to cuts from clean punching. 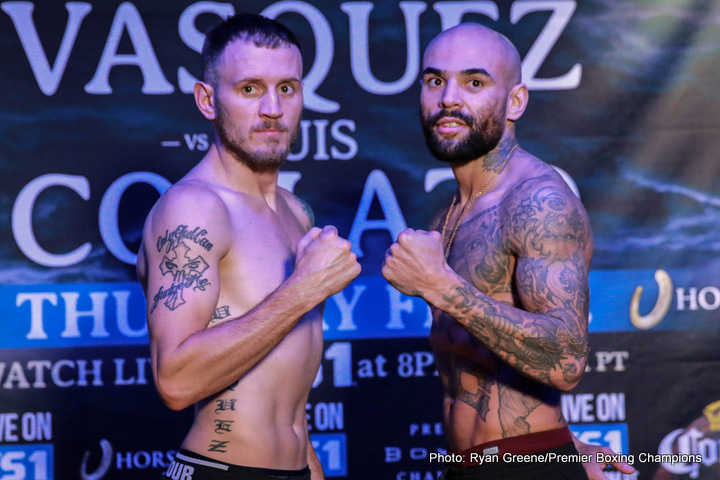 Fast-forwarding to Thursday night there’s no reason why Collazo can’t test the limits of Vasquez. If it weren’t for Abner Mares’s win over Jesus Cuellar in a featherweight title bout and a few other standouts, an argument could be made for Yordenis Ugas as the comeback fighter of the year. A former Cuban amateur standout, Ugas was once an undefeated prospect full of potential. Three losses later it seemed Ugas wouldn’t be able to live up to the high standards of his Cuban amateur background. As is the case with many of the highly-touted Cubans who turned pro and never reached that same level as a professional. After back to back losses in 2014, Ugas took all of 2015 off, regrouped to get ready for what turned out to be a banner year in 2016. In, August, Ugas beat undefeated Jamal James and just about 6 weeks later defeated another unbeaten prospect in Bryant Perrella. Ugas’s next opponent will be the crude come-forward fighter in Levan Ghvamichava. Ghvamichava will bring his toughness and plenty of pop as he pushes forward violently. If Ugas decides to stand in trade it will be a long (or short) night but if he chooses to box at range matched with activity look for the Cuban to pick up this ‘W’. The opening bout Ryan Karl vs. Eddie Ramirez will feature two rising prospects facing their biggest test since joining the paid ranks. Karl is an energetic young fighter who likes to mix it up. Ramirez is a skillful fighter who will likely box on outside first. Of course Karl does have a sizable reach advantage if he wants to go that route. All and all this PBC on FS1 fits the bill like many of their cards on the network did in 2016.